Talk about a good week! Aside from winning my GBP/USD trade, my HLHB Trend Catcher system also did pretty well (again). Ah, I can tell that I’m gonna enjoy my weekend. It was a pleasant surprise to see that after I had posted my update for last week, a valid short setup materialized on my HLHB Trend Catcher system. But you know what made it even better? The trade turned to be a winner! The first position closed with a 150-pip win at 1.3644 while the other remaining half took profit when another crossover materialized at 1.3683. As usual, a few fakeouts materialized during the week too. The momentum indicators that I incorporated in my system didn’t really filter them out as the Average Directional Index (ADX) was above 20 for the most part of the week and RSI was above 50 for upward crossovers and below 50 for downward crossovers. No worries though! Each of them were immediately closed with each loss not going over 19 pips. And finally, my happiness was further compounded when the system caught the huge drop on EUR/USD yesterday. 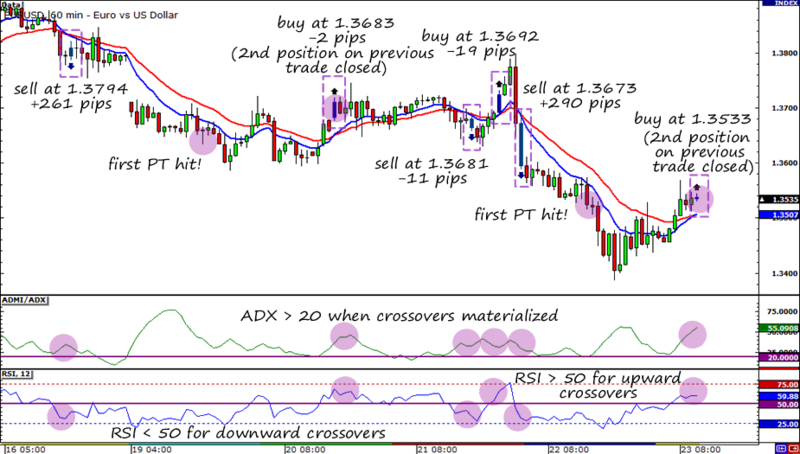 A valid sell trade materialized at 1.3673 and it closed with a 295-pip win with the first position taking profit with 150 pips at 1.3523 and the other position closing at 1.3633 when an upward crossover materialized. It appears that risk aversion is in vogue again, with the dollar gaining versus other major currencies except yen. The trigger was none other than the much-anticipated FOMC statement. According to the Fed, they will go ahead with Operation Twist, which consequently spooked market participants. I don’t know exactly how this new market theme will play out next week, but I’ll go out on a limb and say that risk aversion will continue to persist. For now, I have a bullish bias on the dollar and will continue to look for setups that involve buying the currency! Stay tuned for my next trade idea folks!